These salmon patties or salmon cakes are a perfect way to use up leftover baked salmon. The patties make a lovely lunch recipe served with a salad, or add something a bit heartier, like rice and serve them for dinner. They are a great easy dinner recipe. Boil the potatoes until soft, then drain them and mash them (see hints below). It is important that the potato is free from lumps. Mix the flaked fish into the potatoes, gradually adding seasonings, onion and parsley. Add the corn if you are using it. 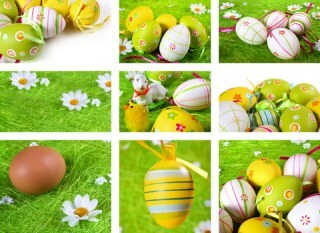 Bind it together by mixing in the beaten egg. Shape the mixture into patties. Put them onto a tray or cookie sheet and chill in the freezer or top of fridge for 30 minutes. Flour your hands and dip each cake into the beaten egg mixed with water, and then coat with the bread crumbs. Press the crumbs well into the cakes. Chill for another 30 minutes. Fry for about 4-5 minutes until crisp. The fried salmon cakes can be refrigerated or frozen and reheated as required. This recipe makes 12 patties. The chilling isn’t absolutely essential but it does help the patty keep it’s shape while breading and cooking. The potatoes can be mashed with a regular masher but using a ricer or pressing them through a strainer works best. That way you ensure you have no lumps in your potatoes. You can certainly use all salmon instead of mixing with the haddock. Use canned salmon if you prefer. 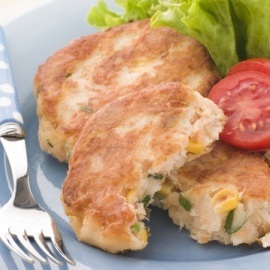 To shape the fish into cakes you can also flour a board and use a 2 inch cookie cutter to cut them. Add some corn kernels for added nutrition and color. The recipe mentions deep frying. You don’t need to use a deep fryer. Just put a fair amount of oil into a frying pan. Kids will probably love this salmon patty recipe. Even if they don’t usually like salmon, mixing it with the potatoes makes it much more interesting and palatable for them. Salmon patties are a great way to use up leftover salmon. Sometimes you just can’t look at a salmon topped salad the next day. This recipe is perfect when you want something quick and a bit different. Find the rest of our tasty salmon recipes here. In the mood for crab cakes rather than salmon patties? Find our recipe here.